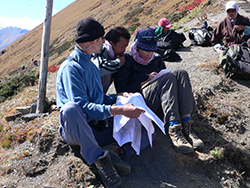 The Department of Earth Sciences offers M.Sc. and Ph.D. programs in a variety of fields. We are a small, welcoming department, with first-rate facilities and excellent collaboration among students and our nationally and internationally recognised faculty and adjuncts. At any one time we have 30-40 graduate students registered, with roughly equal numbers of M.Sc. and Ph.D. students. We typically admit about 10 new students a year. Excellent students admitted to an M.Sc. programme may be eligible to transfer to a Ph.D. programme after their first year of study. Most faculty members supervise 1-3 graduate students at any one time, depending on funding and projects available. Additional graduate projects are available through collaboration with colleagues in Oceanography and Environmental Sciences, and with our Adjunct professors at other institutions. Contact our Graduate Co-ordinator and/or individual faculty members for research opportunities available in your field of interest. 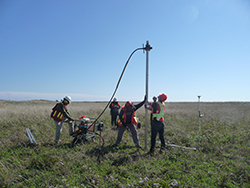 Most student projects combine field and laboratory research, with field work conducted in areas as diverse as the Canadian High Arctic, the Himalayas, the Pacific Ocean, here in Nova Scotia, and across the Canadian Shield. Visit our Faculty and Research pages to find a research topic that is right for you. For best results, potential applicants should contact our Graduate Co-ordinator or one or more faculty members directly before applying. Applicants are considered for funding at the time of application - see our Graduate funding page for further details.